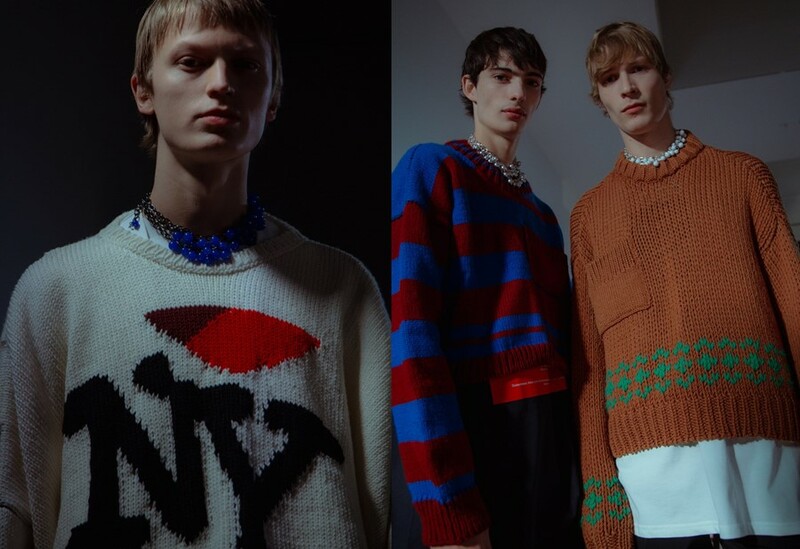 Last night, Raf Simons made his New York Fashion Week Men’s debut with a show that paid homage to the Big Apple – the city he now calls home, thanks to his new role as chief creative officer of Calvin Klein. Simons was in the middle of designing this collection when Donald Trump was elected President of the US. Backstage he said that he couldn’t help but speak up and bring a “kind of energy” that stands against the intolerance and hate the new POTUS embodies. His cast donned garments emblazoned with slogans such as “YOUTH PROJECT”, “OUT OF THIS NIGHTMARE” and “I ❤️ NY”, along with droopy sweaters, woollen arm warmers and belts made from duct tape – things that seemed to hint at the notion of security and protection. At the same time, his models wore necklaces that looked almost like rosary beads. The show represented a major moment for New York menswear which has struggled to generate the same amount of excitement as the other fashion capitals. Charged with the energy and fresh ideas that Simons is almost singularly capable of, the show feels like the first bit of good news to come from across the pond in a while – except perhaps that of Beyoncé’s pregnancy. Stay tuned for Patrik Sandberg’s review of the show.